Youngsters Theology: Let's go THROUGH the roof! A few weeks ago, we began with our new set up for Worship on Wednesday (WoW). Every Wednesday after dinner, we gather in Quilling Chapel at Church of the Holy Communion for Compline. Each week we alternate with clergy, lay leaders and volunteers and youth of the church giving a reflection of a Bible verse that speaks to them. Each Wednesday, I will begin posting these reflection here to share the stories and memories we are creating here at Holy Communion in Memphis, TN! Well, these friends were just not going to accept that. So they carried him. Now, I don’t know if you’ve ever tried to carry a friend of yours for more than a few seconds, but it is not light work. Imagine how much work it would be to carry your best friend for several miles, even with help. But to these friends, the extra labor seemed well worth it. They brought their sick friend to the house where Jesus stayed. But again these friends refused to leave him behind. And I imagine they remembered things their sick friend had done for them before. Maybe before he was sick he used to get them up early to do something fun. Maybe even after his sickness came he inspired them to care for each other. Maybe he always made them laugh, or gave great advice, or listened. And these friends stayed on the lawn with the one who was sick while they thought about what to do. And at this point, the crazy one—I think every group of friends has a crazy one in it—said, “I’ve got an idea.” And the others, based on experience, were not expecting to hear a good idea come out of his mouth. “We climb up on the roof, dig a hole through, and lower him in that way.” Well, the others were right. That was a terrible idea. “Are you serious? That house is packed to the gills with Pharisees, and rabbis, and lawyers—you know, adults!” And they all agreed that they would get in a ridiculous amount of trouble for destroying someone’s roof in full view of the crowd, let alone Jesus himself. But another ten minutes went by, and no one had a good idea. …And if it worked, and they got through to where Jesus was, maybe it’d be worth the price they’d pay. Finally, they all agreed to take the risk. If digging through the roof was their sick friend’s way into Jesus’s presence, then the roof had to come down. So they climbed the walls of the building, and hoisted their paralyzed friend up to the roof. Of course, the paralyzed friend can do almost nothing to help them lift his body weight a dozen feet or more. But the difficulty did not deter them. And then they started pulling up mud and straw, or maybe kicking holes in clay, destroying whatever barrier was left between them, their friend, and Jesus. And finally they created a way through, and lowered their friend down. And that might have been the end of the story. Notice that Jesus did not immediately heal the man. What the sick friend had come for, and received, was forgiveness and reunion with God. And having received that gift, he could have been carried from the house in want of nothing more. The reason the story goes on is not because the sick man wanted something else from Jesus, but because everyone else did. They were angry with this man and his friends for their intrusion, and their reckless vandalism. What right did Jesus have to forgive them? It wasn’t Jesus’s house that got ruined! And so their anger turned on Jesus for overstepping his bounds. 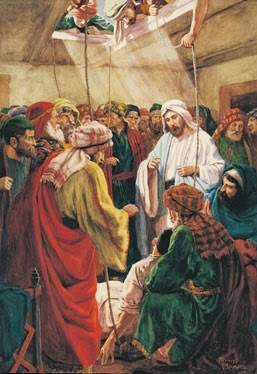 At this point, to silence their arguments and prove that the man was truly forgiven, Jesus healed him. And he got up and walked out. Imagine the celebration of that group of friends with the one who was healed back out on the lawn. The work they had done and the risks they had taken had paid off more than they ever dreamed! Their friend, whom they had carried in brokenness, would walk home beside them, forgiven. I’ve never had a major illness. I’ve never broken a major bone. My younger brother, on the other hand, was diagnosed with diabetes when I was sixteen. My mom got breast cancer when I was eighteen. And friends of mine had divorced parents, or struggled with depression, or faced all kinds of problems that I didn’t. And it bothered me. It seemed unfair to them that I should get to live without such burdens. I thought I needed to suffer more to be a true Christian, to be like the paralyzed one that Jesus forgives and heals. But I’ve since realized that the friends who bring their sick pal to Jesus are also heroes in that story. Without their labor and daring and love for their friend, he would not have reached Jesus. Sometimes we identify with the paralyzed man, but most of the time, we have the opportunity to be like his or her friends. Am I saying you ought to literally dig a hole in someone’s roof? Well, if through that roof is the only available path to the presence of God, then yes! Dig it up! Probably, it won’t be a roof. There are all kinds of obstacles that make it hard for those who are suffering to experience God’s love. If you find one, do everything you can to remove it. Be the friends who are willing to do hard work and risk rejection from the crowd in order to open someone’s path to the Holy Spirit. It might not heal them, but it may make them whole.